Beginning with the 2015-16 school year I began posting PD information in the HS Teacher Google Classroom instead of on this page. Analyze Iowa Assessment Data with the intent of developing a goal for 2014-15. Use Iowa Assessment reports. If you choose to look at item analysis reports you may want to view the item analysis PowerPoint and item analysis chart. Iowa Assessment reports and test booklets will be available. Copy reports you need and return originals to folders. DO NOT COPY TEST BOOKLETS. All materials must be returned to Mr. Wall's office today when you are done. Develop a goal and action plan for 2014-15. A blank action plan template is provided. Type or write a simple summary of what you accomplished today and what still needs to be done. Make sure hard copies of all work, including your summary, is put in to your binder. Designate a record keeper to keep electronic records of your work as well. There is probably more here than you can complete today. Discuss with your PLC when you can get together to complete this work. I'd like to have it all done by the time you check out for the year. I know that's asking a lot but I simply don't know if we'll have time to continue this work in the fall and I don't want to end up with no goals and no action plans for next year. If possible we'll revisit the action plans next fall. As you view each section use the Areas of Support & Process Questions document to take notes. Hard copies will be provided Wednesday, Sep 25 or you can download and print document below. Collaboratively discuss the reflection questions for each video with each member of your PLC entering your responses in their own PD 360 account. Following discussion of each video each member of the PLC should record new learning and ideas in their PD 360 journal. The PLCs depicted in the videos are in a school much larger than ours. How do you adapt the PLC concept to a school our size? What do you see your PLC needing to do to adequately answer the first PLC Process Question-What do students need to know? 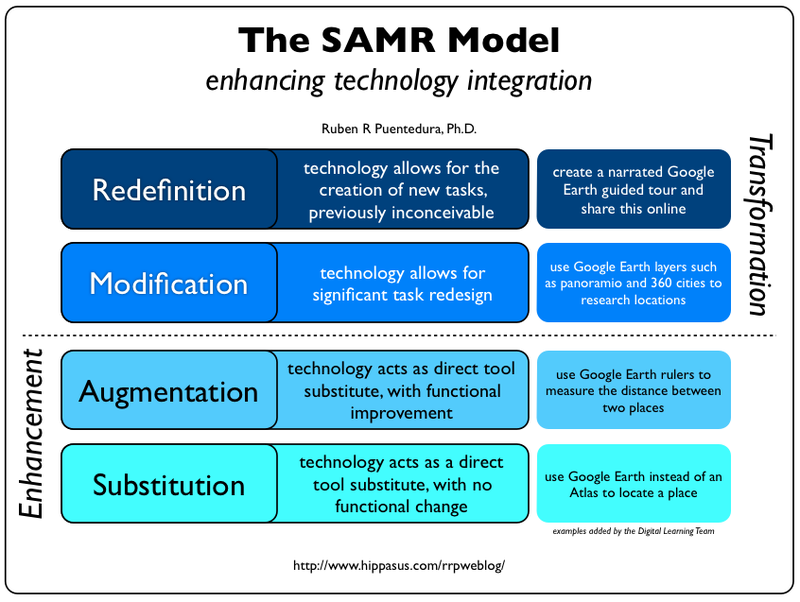 SAMR Presentation with example over time.